This Post has already been read 1857 times. 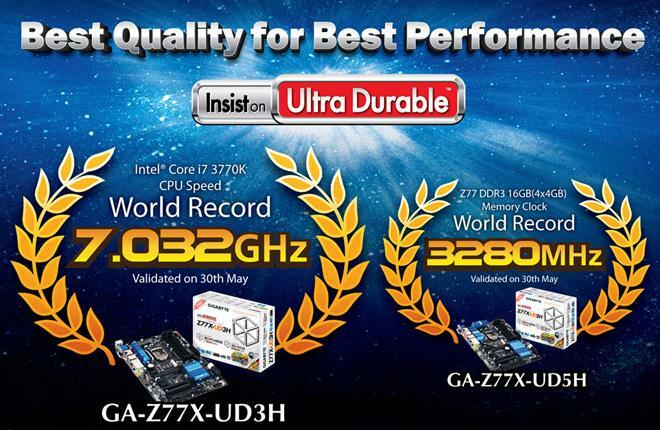 Ivy Bridge reviews mostly agree that the new architecture doesn’t overclock as well as Sandy Bridge, but that didn’t intrepid overclocker HiCookie reaching 7.032GHz – a word -record – with a Intel Core i7 3770K running on a Gigabyte motherboard. He also set a world record for DDR3 overclocking while he was as it. The world record have been validated by CPUZ and Canard PC. Before you buy it a similar setup to use at home, you should know that this clock speed was achieved while cooling CPU with liquid nitrogen. FOr the DDR3 record, four G.Skill Trident X DDR3-2800 modules were used and they hit 3280MHz. A different motherboard was used too – a GIGABYTE GA-Z77X-UD5H.